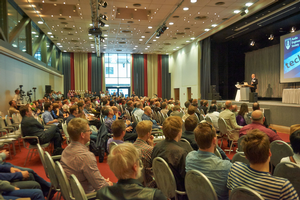 The 136th Audio Engineering Society Convention, taking place Saturday, April 26, through Tuesday, April 29, 2014, opened today with healthy attendance at the Estrel Hotel and Convention Center in Berlin, Germany. Offering a wide variety of Technical Program events, manufacturer exhibitions, the Project Studio Expo, and more, the 136th AES Convention brings attendees the latest in professional audio innovations, as well as networking and educational opportunities with leaders in the industry. Additionally, AES Executive Director, Bob Moses, made the announcement that next year’s European AES Convention will take place in Warsaw, Poland (Spring 2015) taking advantage of it’s burgeoning audio industry and growing base of audio engineers, producers and music aficionados. Photo Caption: Wieslaw Woszczyk delivers the keynote speech at the 136th Audio Engineering Society Convention Saturday, April 26, 2014 at the Estrel Hotel and Convention Center in Berlin, Germany. For the latest information information on AES136 technical program, presenters and registration, visit the AES136 Convention web page at http://www.aes.org/events/136/.